Here’s a great itinerary for spending one day in Montreal, one of Canada’s most colourful cities. You’ll find restaurant suggestions, top sights, shopping and some choice bits of history. If you’re spending one day in Montreal, a good portion of that will be taken up eating. 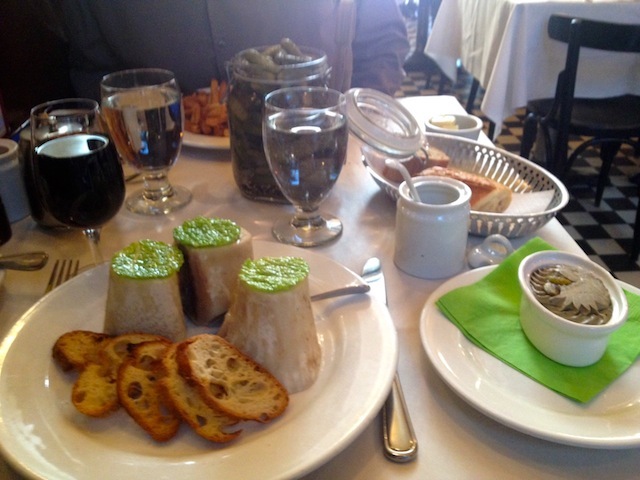 And when you’re considering where to eat, you need first to answer the Montreal dining question of the day: Can you order both the Bone Marrow with Coarse Salt and the Chicken Liver Paté with Pistachios at L’Express on Rue Saint-Denis and call it a well-rounded meal? Montreal dining answer: Not unless you order a glass of red wine to go with it (or drink your husband’s, which is just as good). Next Montreal dining question: Will you feel ill after you eat every scrap of bone marrow and chicken liver paté and don’t share? Definitely. Lesson learned: Next time order two glasses of wine. Take a lazy morning. Sorry, I know I said you’d have a lot to do, but isn’t lingering in bed one of these necessary indulgences (especially if your bedding is as luxe as ours was at the Hotel Le Crystal)? 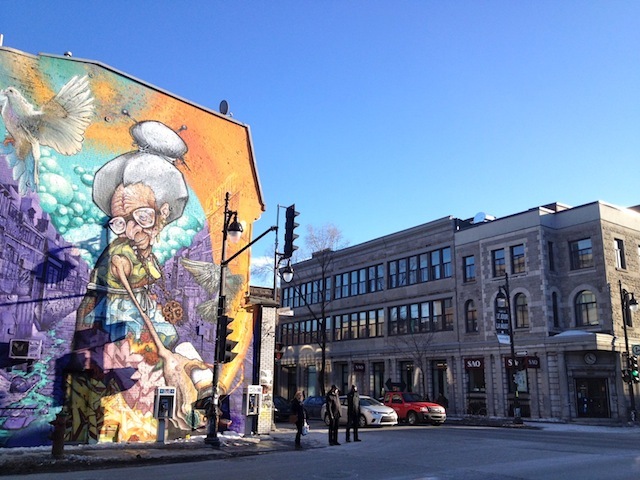 Skip down (not literally – you’ll look ridiculous) to Old Montreal. Grab a café au lait and House-made Ricotta with Honey, Orange Zest and Maldon Salt with Toast at popular Olive and Gourmando at 351 Saint-Paul West. Montreal dining warning of the day: Expect crowds. You may be fighting for a seat. Please be nice even though you haven’t had any caffeine yet. You’re a visitor here. There is much to do in this picturesque part of the city so get cracking. (Who told you to sleep in, anyway?) 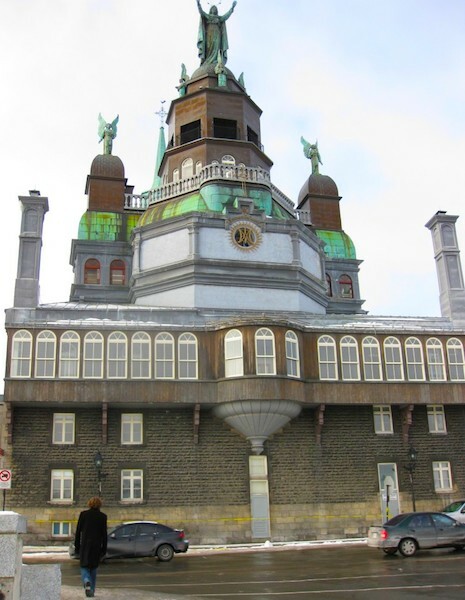 First, you should read my Montreal travel articles: The King’s Daughters in Montreal and Montreal Stained Glass Mysteries for a grounding in history and mystery. Now look down at your feet. You’re standing where it all began. The oldest part of the city. 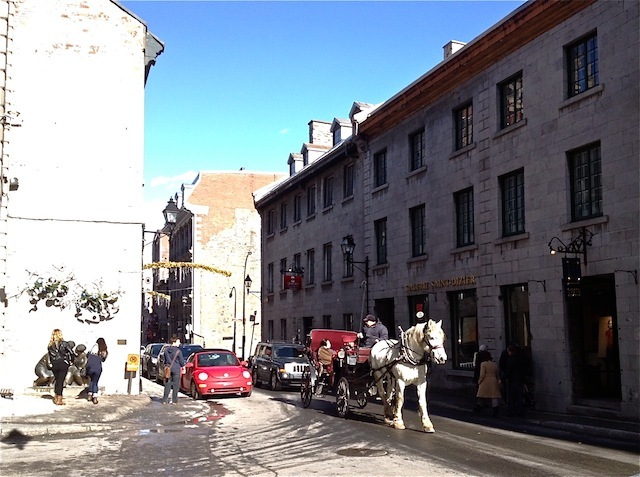 French settlers founded Montreal in 1642 (mind you, the Iroquois were here long before that) and the cobblestone streets, boutiques, horse-drawn carriages and Old Port views of the St Lawrence River are worth some quality sightseeing time. 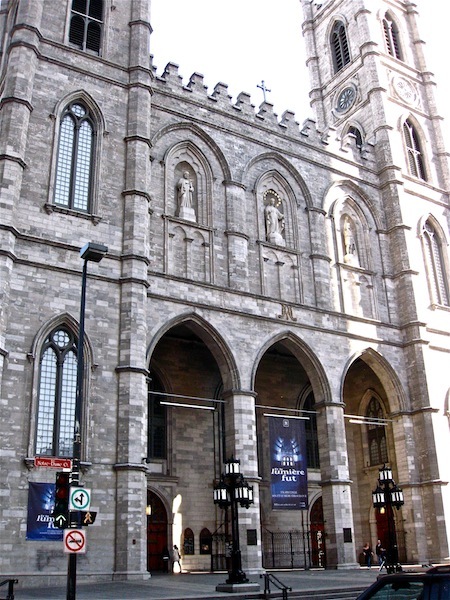 The blockbuster site in Old Montreal has to be Notre-Dame Basilica, located at Place d’Armes Square. This Gothic Revival basilica built in the 1800s has enough glittering stained glass and gilded wood (plus a starry blue sky, otherwise known as a star-spangled vault) to impress even the most jaded church sightseer. Fun Montreal fact: Instead of religious symbolism, the side windows of Notre-Dame depict historical scenes of early Quebec history. They were designed by Quebec artist Jean-Baptiste Lagacé and made in Limoges, France. The basilica is magnificent but I’m partial to a different Notre-Dame, Notre-Dame-de-Bon-Secours Chapel at 400 Saint-Paul St. East. It was originally founded back in 1655 by Canada’s first female saint, Marguerite Bourgeoys. 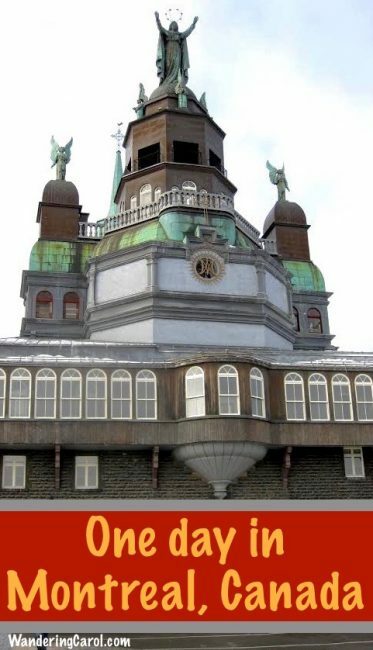 Fun Montreal fact: In the Leonard Cohen mega hit Suzanne, the lyrics “And the sun pours down like honey/On our lady of the harbour” refer to the statue of the Virgin Mary on the dome of Notre-Dame-de-Bon-Secours. 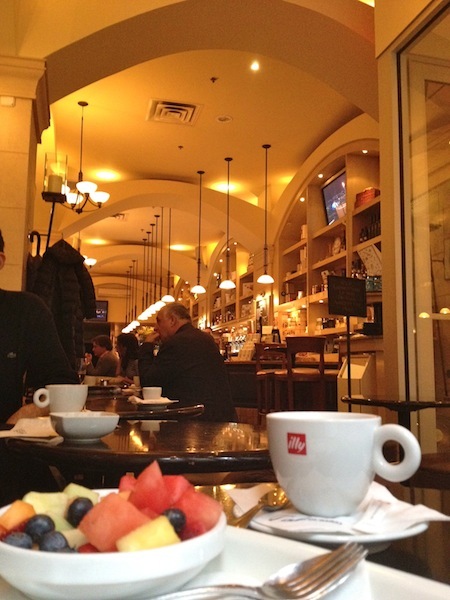 For lunch it’s time to leave Old Montreal and go to Paris, I mean L’Express, which feels like Paris. It’s an authentic French-style bistro and much beloved by locals, so make a reservation. 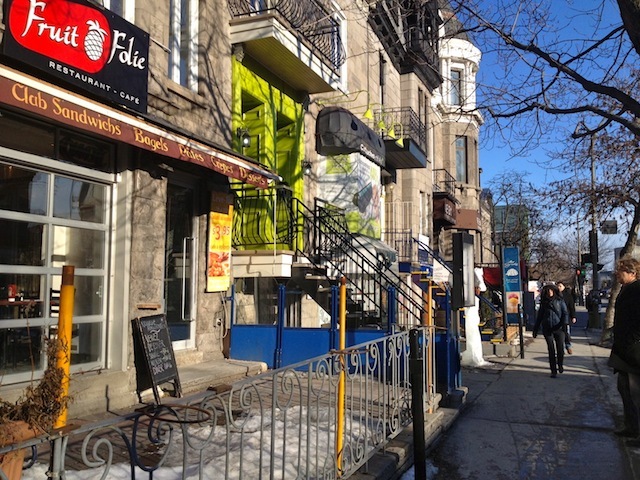 Located at 3927 Rue Saint-Denis. Tel: 514 845 5333. And if you eat both the bone marrow and the chicken paté and then you need a nap and miss your one day in Montreal, don’t blame me. Finished eating? Wander along Rue Saint-Denis and the parallel Boulevard Saint-Laurent to look at the boutiques and vintage shops, soak up the Left-Bank-in-Paris atmosphere and wear off some lunch calories (no one told you to eat that third piece of bread). 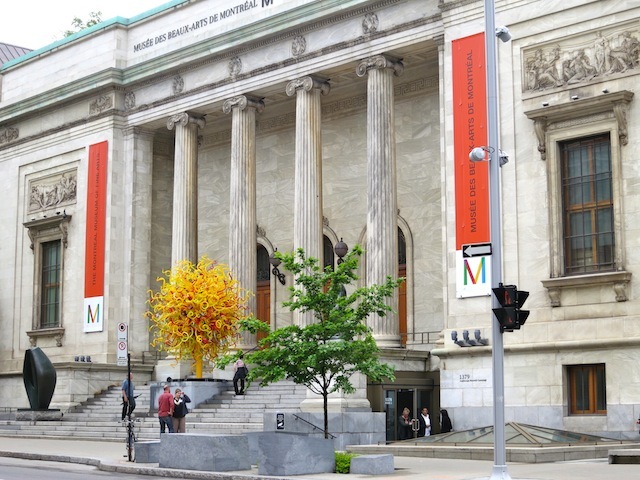 For a splash of world-class art head to 1380 Rue Sherbrooke Ouest to visit the ever-popular Montreal Museum of Fine Arts (full disclosure: the work of my late father, William Perehudoff, is in the collection, but I’d recommend it regardless). You must need a coffee break by now. If you want something ritzy (literally), just across the street is the swanky Ritz-Carlton Montreal, 1228 Rue Sherbrooke Ouest, where you can stop for Afternoon Tea (if you can possibly stuff it in after L’Express). The Ritz-Carlton Montreal has been serving afternoon tea since 1913, and at the very least you can rest your feet and drink some of the Ritz’s own Blue Sapphire blend. Because you’ll need renewed energy for shopping! 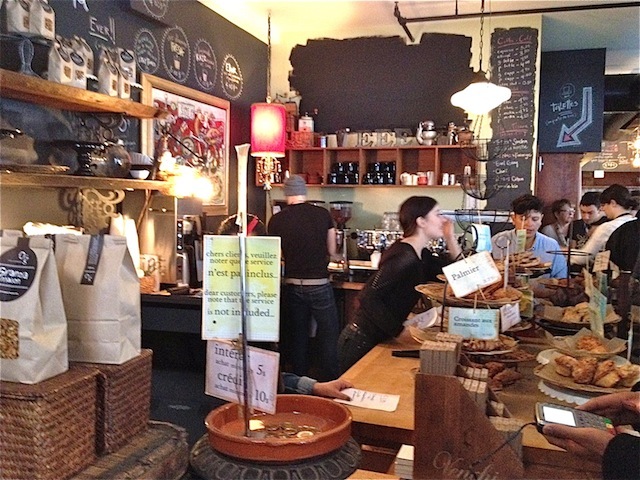 Alternatively, you could try the upmarket Café Vasco da Gama at 1472 rue Peel. If you’re a glutton for cholesterol you could opt for a Beef and foie gras burger. I, however, took the healthy high road (because I was still feeling ill from my bone marrow and chicken liver paté lunch) and ordered yogurt and fruit salad. First stop? La Maison Ogilvy, a glamorous department store at 1307 Rue Sainte-Catherine Ouest. It’s Canadian owned (even though Holt Renfrew bought it), has buckets of old-fashioned elegance including a spiral staircase and, if you skipped my lunch and afternoon tea suggestions, you can grab a fresh salad in the basement cafe. 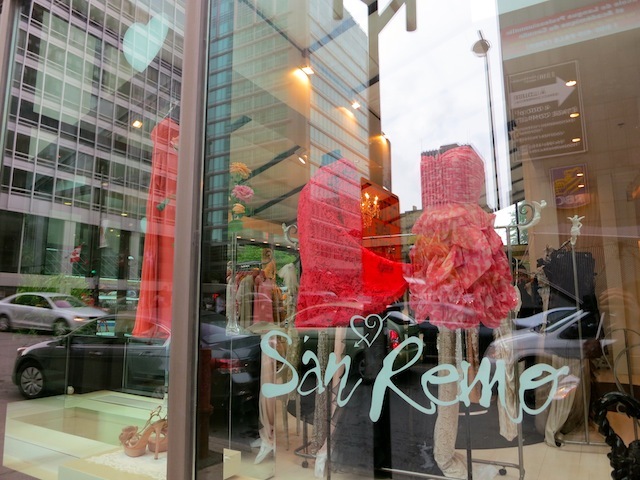 If you’re strapped for cash after that visit La Maison Simons at 977 Rue Sainte-Catherine Ouest for more affordable options – also Canadian owned. Also, if you have time, and I never seem to, La Canadienne at 273 Laurier Ouest has wonderful boots. Why is shopping so exhausting? Don’t you need a whirlpool and sauna break about now? 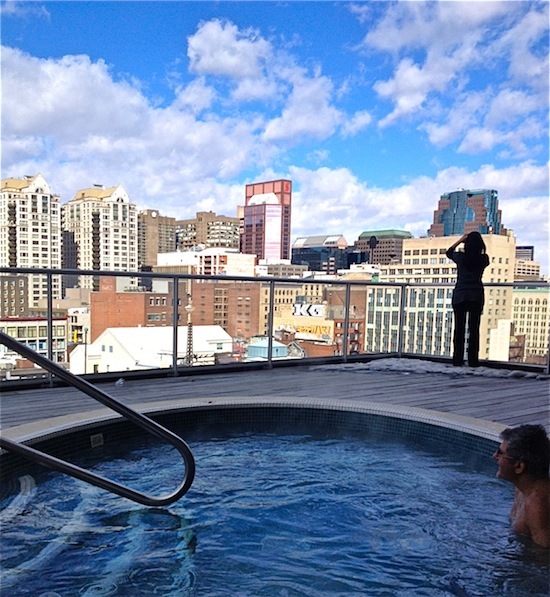 Here are a couple of options: If you’re staying at Hotel Le Crystal head to the spa, sauna and outdoor whirlpool on the 12th floor great for views of Mount Royal. 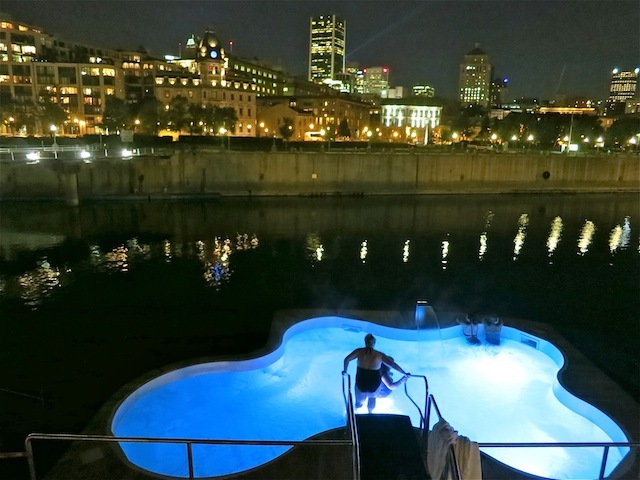 For something completely different taxi it back down to the Old Port of Montreal to Bota Bota, a Nordic-style bathing complex based on hot and cold water therapies set on … a boat! 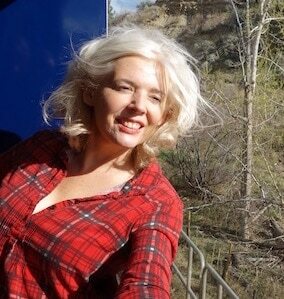 It’s an authentic docked ferry boat on the St Lawrence and offers divine city views as you soak in a hot tub. A 5-deck floating spa with steam, sauna and a cafe – how can you go wrong? Late dinner: If you’re a meat lover, Pied de Cochon comes highly recommended. Where else are you going to get a Happy Pork Chop and Pig’s Head for Two? Bon appetite! 536 Avenue Duluth Est. Tel: 514 281-1114. Where to stay in Montreal: If you like bling and good leisure facilities, the centrally-located Hotel Le Crystal is for you. 1100, rue de la Montagne. Here’s my review of the Hotel Le Crystal. Montreal, Quebec. 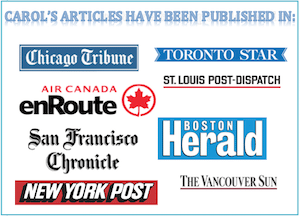 What a great time to be in Montreal and Quebec City. Have fun! Thanks for sharing, Carol! We’re heading to Montreal + Quebec City for 4 – 5 days before Christmas and are trying to figure out how to maximize our short time in each! I’m about to take what is probably my 15th trip to Montreal from South Carolina, and your page put me in the mood to enjoy the place again next week. Good job of capturing the soul of a place unlike any other. Terrific post, Carol, I’ll be printing this one off. Glass really is such an important part of the Montreal scene. I saw people lounging on the deck of Bota Bota from a distance in October, would love to experience it up close next visit!